The Peachy Keen Queen is celebrating her 29th birthday (again). I created this little birthday penguin to mark the occasion. 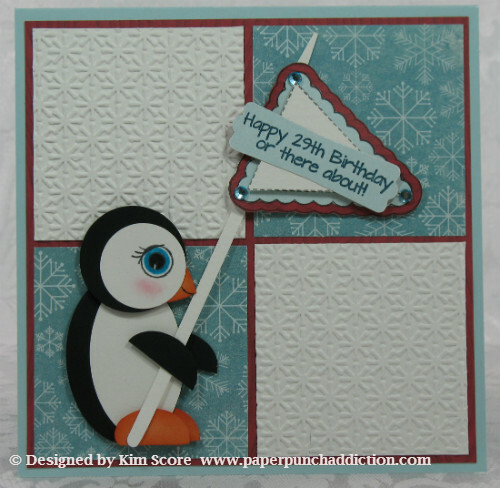 He is so easy to make but looks so adorable on any kind of card! The pennant was created using the PK-157 Pendant Banner set. The greeting is from the December Stamp of the Month set. Overlap white oval onto black oval for body. Cut bottoms off pumpkin ovals for feet. Sponge edges with Cajun Craze ink. Glue one foot onto back of body. Attach other foot on front with dimensional. Cut small black oval in half. Glue one half onto back of body and attach other half to front with dimensional. Glue white circle onto black circle. Stamp eye from PK-134 Bird Faces and More set. Add color around pupil of eye with Island Indigo marker. Brush pink pastels onto cheeks. Sponge edge of small heart with Cajun Craze ink and glue onto back of head for beak. Draw line for mouth. Try adding a little hat or scarf to the penguin for the holidays! Wow, you are amazing with those punches! That penguin is great! So cute Kim! That little penguin is ADORABLE!!! This is so cute!! You are the paper punching queen!! So awesome!! Very clever use of the eye stamps. Well done!